OceanGrip is an acrylic-based, pressure sensitive, peel and stick, marine traction product, developed in conjunction with 3M. 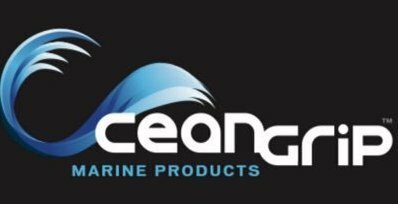 Different to other marine traction products on the market, OceanGrip prides itself in providing USA made, non-absorbent, UV-protected products constructed from Ethylene vinyl acetate (EVA) foam, a product known for its durability, stress resistance, and waterproof properties. Innovative features of OceanGrip products also include a dimpled surface which aids in maintaining a non-slip surface when the traction product becomes wet. Additional applications for OceanGrip may include Rod protection under gunnels, Helm Pads, Platform decks, Surfboards, Kayaks and paddle boards. In fact, OceanGrip is appropriate in any area in which you desire traction, comfort, and a soft ride. Protection to boat surfaces, chip resistance and a reduction of hull noise, are all other reasons why you should choose OceanGrip. OceanGrip is easy to install and requires no mounting or hardware due to its peel and stick nature. It is easy to clean and stain resistant, and can also be custom fitted to most aquatic applications. To assure accuracy in fitting, OceanGrip is able to send a technician to your home or boat dock. A custom design of your traction pad (s) is completed utilizing the most updated and current design software and then sent to our State of the Art Computer Numerical Control (CNC), for a precision cut that will ensure your OceanGrip fits like a glove. Why Should You Choose OceanGrip? When it comes to providing a non-skid deck for their watercraft, boat owners and operators have multiple options available to them. However, when choosing OceanGrip non-skid marine traction products, the difference becomes clear; Unique, durable, attractive, and comfortable surfaces for your vessel. Made in the USA from special non-absorbent foam that is UV protected, it gives you long lasting protection that is scratch, chip, and dent resistant, and will set your vessel apart from the rest. With the increased traction from OceanGrip non-skid decks, you will have a safer boating and water experience, especially for activities such as fishing, water sports, and diving. Concentrate on having fun, not on getting from one side of the boat to the other! Applications for all Water Activities! OceanGrip partnered with 3M to produce a top of the line, marine-grade, pressure-sensitive adhesive, which allows OceanGrip to be installed easily. Simply peel, place, and stick in the area you desire to have protection on your watercraft. Highly durable, visually appealing, and shock absorbent, OceanGrip’s pads provide safe traction for any water vessel, whether you pilot a luxury yacht or a personal watercraft. With the ease of installation and customizable non-skid pads from OceanGrip, you will find a use for them on any and all watercraft you own, from commercial and personal fishing boats, airboats, ski boats, houseboats, SCUBA outfitters, personal watercraft, platforms, and even your boat dock steps.